In my heart, I knew it. Sagittarians are notorious procrastinators and we start any number of things while only managing to finish a few of them. So many projects litter the path of my life. But, when I get something started that turns out to be fun, and which I promised to someone, including myself, I jump in and it feels fun again. So I came home from work and dived back into the curtains. With the side seams stitched, it was time to do the top casing. These are rod pocket curtains. For those unfamiliar with curtain terms, these are the kind that slide over a rod. There is a casing to insert the curtain rod. Sometimes, there is a bit of fabric above the casing for decoration. Sometimes there isn't. I'm making the tops with an inch of fabric at the top to give the curtains some height. So, I have the raw edge stitched. Then, I wanted to make a casing one inch wide with the one inch header. 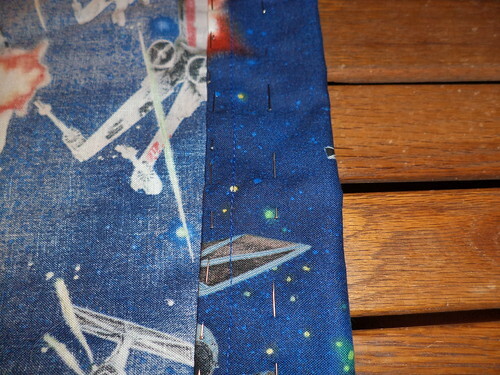 I pinned two inches which will be folded over and two rows of stitching done to make the casing. Of course, the help had to come investigate or supervise. I'm never quite sure. Once I convinced her to move, I could fold over the top and pin it. 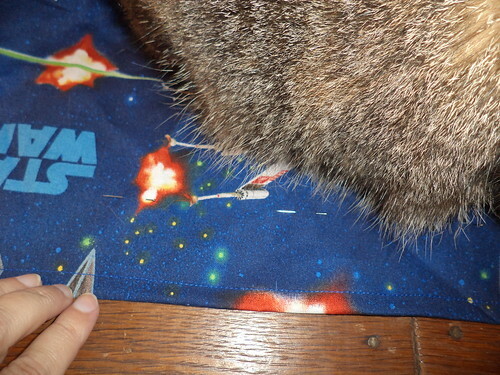 Then, I measured from the seamed edge one inch and pinned that line. That is the top sewing line for the casing. 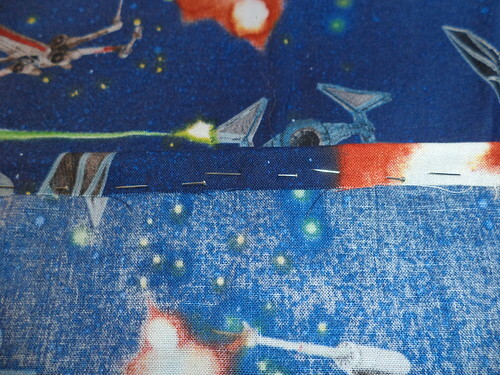 I will be stitching right along the seamed edge, too. 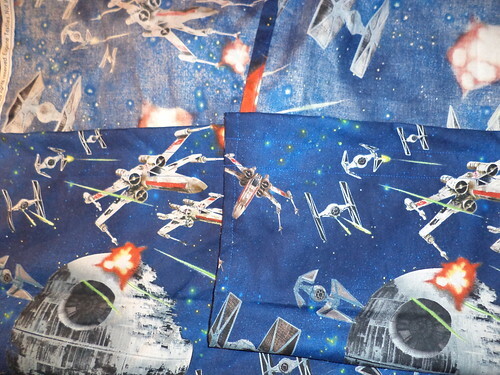 Here's the finished top of the two curtains. The royal blue thread I have is perfect for these. There will be a slight gather to the curtains but they will overlap just enough to cover the window. The next step, tonight, will be to measure from the bottom of the casing to where the hem will go. I should be able to get them hemmed tonight and one pair will be done. I knew, once I got started, that I would enjoy this and would get the project done quickly. It was just taking that first step.